Vlad has a new horn! Once upon a time Vlad had a beautiful blue handblown glass horn with silver sparkles in it. Alas, in an accident his horn was broken and whilst it was awaiting repair, it was lost. A talented woodworker turned us a new horn at the Silver Leaf Renaissance Faire in Michigan, and that horn has been our workhorse for years. In June of 2011 we were fortunate to have a new glass horn blown for us, and this one lights up! Vlad actually has a horn wardrobe now: a pink glass horn, an even larger cobalt blue glass horn, the wooden horn and a special steampunk horn. 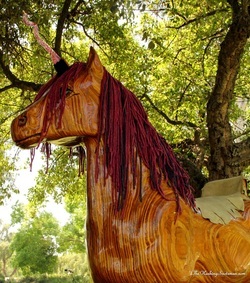 You may have wondered why a unicorn named Vlad the Impaler has pink and purple hair. Well, unicorns ARE magical creatures and as such, they wear whatever makes them happy. Vlad originally had a white mane and tail and a blue glass horn with silver sparkles in it. Later he had light blue hair, and most recently he has had pink and purple hair. In the winter of 2013 Vlad had an entire makeover. He was completely sanded down and refinished. As a part of this, he had a bit of equine liposuction and came out sleeker and with a shiny new golden finish. Soon he will be flaunting a beautiful new horn and quite likely, new hair and a bright new saddle. Keep your eyes peeled for photos of his metamorphosis.